Founded in 2015, New York based "CMD-E" began as a pipe-dream vision between composer Craig Michael Davis and percussionist Rob Guilford, desiring to bring a new, multifaceted voice to the already eclectic world of NYC contemporary music. A collaboration of artists with colorfully varied backgrounds, "CMD-E" has developed a distinctive sound that perfectly unifies the precision and complexity of classical music with the energy of a rock band. Craig Michael Davis is an internationally known composer, conductor, and pianist from California who currently lives in Brooklyn, NY. He performs with ‘The Craig Michael Davis Contemporary Music Ensemble,’ which he founded in 2012. Receiving a Master's of Music in Theory and Composition from the New York University, Craig studied predominately with Michael Gordon and Julia Wolfe. Craig's most recent work Re-Creation, for String Orchestra, was performed by the L'viv Philharmonic Orchestra in May 2015. Since 2009, Craig has conducted various full and scratch orchestra-type ensembles, including the Broadway Chamber Players, the New Music Ensemble at California State University, Fullerton; the Fullerton Choir; and The White Noise Contemporary Music Ensemble. These ensembles have curated music from the Renaissance through music of today including David Lang, Louis Andriessen, Terry Riley, Kyle Gann, Lloyd Rodgers, and Frederic Rzewski. His writing has earned a number of awards and residencies, among which include The 2013 Alan A. Mannason Award for Composition and The 2012 Henriquez Award for Composition. His music has been played in the United States as well as in Europe. Most recently, his works have been performed by the New York University Philharmonic Orchestra; the L'viv Philharmonic Orchestra in L'viv, Ukraine; the JACK Quartet, in New York; and at various new music performance spaces in and around New York City. Craig's music is published through Jack Harrison Publishing Inc.
Emily Crowley is a NYC based musician and actress. She holds a B.Mus in Vocal Performance from NYU Steinhardt. Currently a vocalist in The Christians at Playwright's Horizons, Emily's work spans from traditional music theatre to contemporary new music. She performed as Alina in The Waiting Woman, a workshop of Ronnie Reshef's contemporary opera "Something to Live For", as Antonia in Man of La Mancha and as Mary Hildebrandt in Kurt Weill's "American Opera",Street Scene. She has music directed multiple productions, most notably, a musical adaptation of Boccaccio'sDecameron at the Villa La Pietra in Florence, Italy, with Puts Italy Center Stage (PICS). She founded Ink: A Writer's Group, and is an active musician in the NYC New Music scene. As a solo and collaborative pianist, Borah Han has performed in recitals and masterclasses in Italy, Spain, Korea, and the United States at Carnegie Hall, Symphony Space, Wharton Center, and Skirball Center. In 2009, she appeared as a soloist with the Michigan State University Philharmonic Orchestra. As an orchestral keyboardist, her experience ranges from classical music and operas to contemporary musicals and movie soundtracks. As an active collaborative pianist, she received masterclasses and coaching from the Shanghai Quartet, Paul Roczek, Fora Baltacigil, and Håkan Hagegård among others. Furthermore, Ms. Han specializes in violin-clarinet-piano repertoire as a part of Red Cedar Trio, which took first prize at the University Research and Arts Forum in 2009. In addition to performing, she was appointed as an Adjunct Faculty at NYU to teach group keyboard classes and private lessons to undergraduate students. She also served as a staff pianist for conducting, violin, cello, and brass repertoire classes. She received a Bachelor's degree in Piano Performance with honors from MSU and a Master's degree in Collaborative Piano from NYU where she studied with Anne-Marie McDermott, Jose Ramon Mendez, and Grant Wenaus. Ms. Han currently resides in NYC collaborating with instrumentalists, vocalists, and composers and spends her summer at Interlochen Arts Camp as a staff collaborative pianist. For more, check out www.borahhan.com. Jason Kohler is a Composer and Guitarist born out of the woodlands of Southeastern Massachusetts. He received his B.A. in Music Composition from UMass Dartmouth in 2010 after studying with composers Ken Ueno and Jing Wang. Coming from the world of rock and venturing into contemporary composition through his studies, Jason seeks to express a blend of the familiar and extraordinary through his writing and playing. 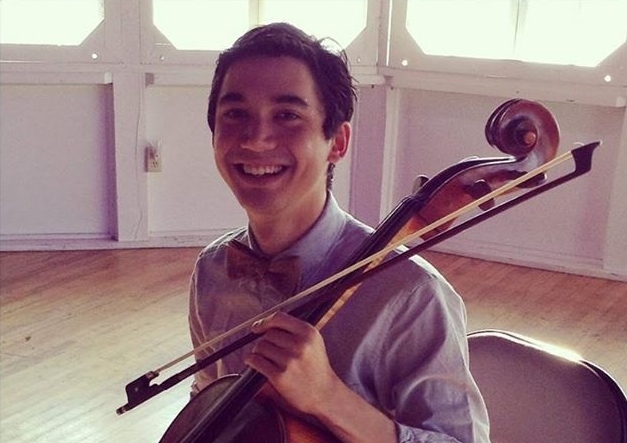 Kevin Schmidt, a double bass graduate student at Manhattan School of Music, also leads an active freelancing career in the New York City area. He has appeared in many ensembles, including Windscape, Ars Musica, New York Classical Players, New York Festival Orchestra, Symphony of Westchester and Astoria Symphony. Some of Kevin’s recent engagements include serving as principal bass for the late Kurt Masur’s conducting seminar, and participating in the inaugural year of the DCBass festival in Washington, D.C.
Cellist and music educator Paul Swensen has earned performance degrees from SUNY Fredonia and SUNY Purchase, studying with Natasha Farny and Julia Lichten. As an orchestral musician Paul has served as a substitute with the Buffalo Philharmonic as well as the Harrisburg Symphony Orchestra. As a teacher, Paul is a faculty member of the Paterson Music Project in Paterson New Jersey, modeled after El Sistema, which provides music education to underprivileged children. Maximillian Zooi is a New York based Saxophonist, Bass Clarinetist, Pianist, Composer, Songwriter, Arranger and Bandleader. Originally from Los Angeles, California, he attended the New School for Jazz and Contemporary Music on a full scholarship and graduated in 2014. As a lover of Jazz music, Classical music, Indian classical music, and more mainstream genres such as Pop, Hip Hop, and Neo-Soul, Max has forged a musical identity that does not conform to any single genre or style. His songs retain influence from all aforementioned genres but in doing so also contain many idiosyncrasies that hold the key to his personal identity as an artist. He is also a well versed composer and arranger, with works written for all manor of orchestral and jazz instruments.